MacBook Air (Early 2015)は4K（3840×2160）ディスプレイでリフレッシュレート60Hzをサポートしているもよう。 | AAPL Ch. 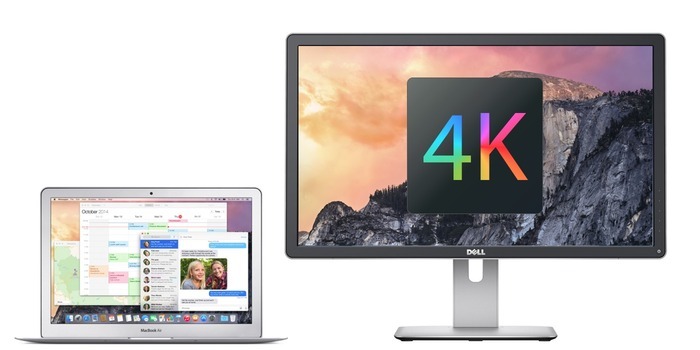 We were fairly sure that Apple’s spec page was incorrect, but to get a definitive answer we dove into the still-nascent 4K display ecosystem to do some testing. 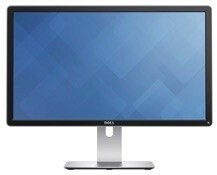 The short answer is that yes, both the Pros and Airs now support 4K output at 60Hz using a single DisplayPort 1.2 cable. Last year’s Air connected to the same display with the same cable can manage, at best, a blurry 2560×1440. 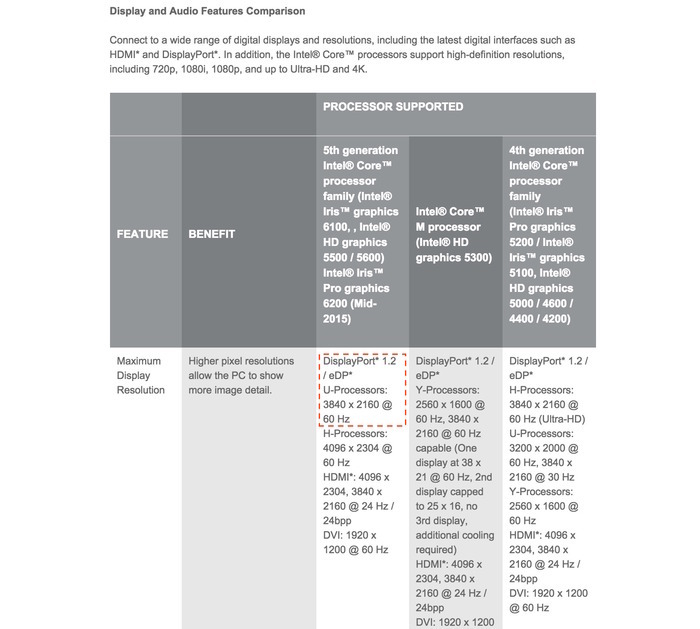 Intel’s documentation tells us that the new Broadwell-U processors and their integrated GPUs support output of up to 3840×2160 at 60Hz when connected using DisplayPort 1.2, where the Haswell versions were capped at 30Hz (4K over HDMI remains capped at 24Hz, a limitation of the HDMI 1.4 spec). 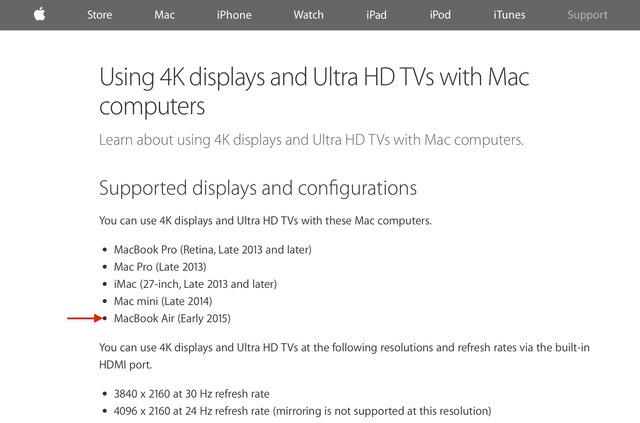 Despite what Apple’s spec page currently says, connecting the 2015 Air to the P2415Q worked perfectly. The Mac detected the display, noticed that it was 4K, and without any extra cajoling began displaying in HiDPI mode. You get the same usable screen space as a standard 1080p display, just with sharper images and text. 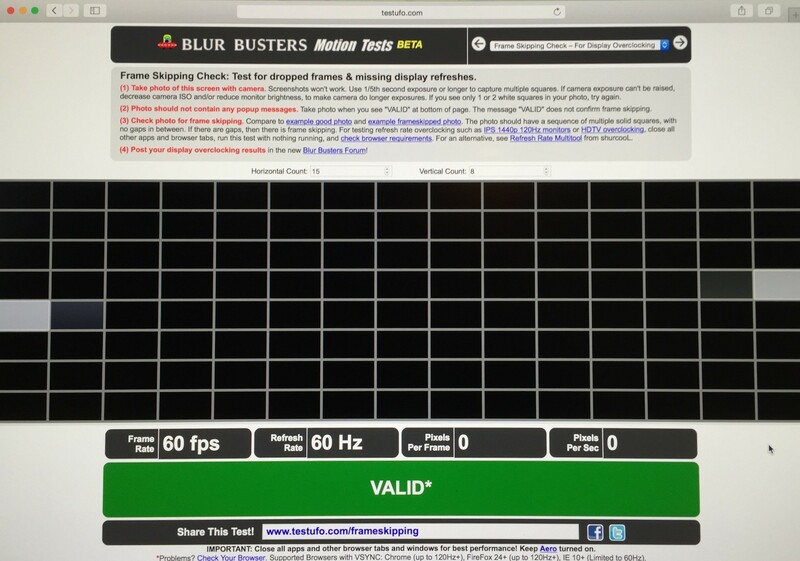 The BlurBusters refresh rate test verified that we were looking at 60Hz output. Dropped frames are clearly visible when entering into Full Screen mode or using Mission Control, and of course you’ll never want to try playing games or doing heavy 3D work at native resolution. But things are more than smooth enough for desktop use. So there you have it: the new MacBook Air definitely supports 4K displays at 60Hz in SST mode, and it actually supports them fairly well if you’re not using OS X’s scaling functions. >We’ve informed Apple about the issue, and hopefully the specs pages will be updated accordingly.